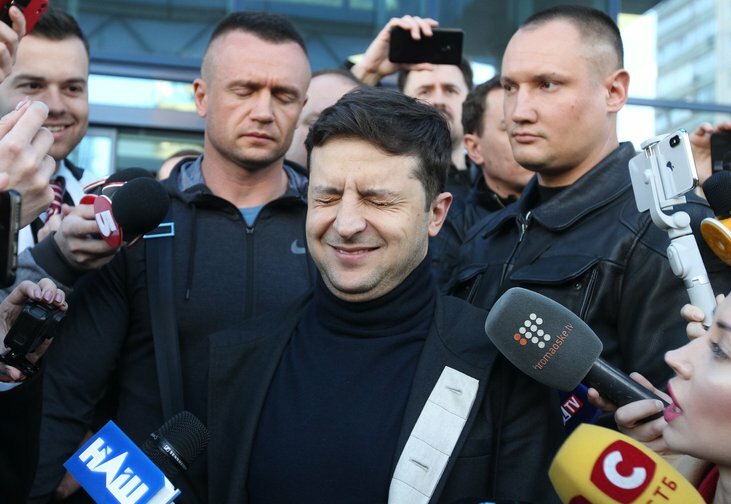 Ukrainian presidential candidate Volodymyr Zelensky surrounded by media, Kiev, April 5, 2019. Pavlo Gonchar/PA. All rights reserved. Back in the early 1990s, when Rob Newman and David Baddiel were selling out vast arenas, it was briefly posited that “comedy is the new rock’n’roll”. Today one might surmise that “politics is the new comedy”. In addition to the reality television star in the White House, the party with the largest vote share in Italy’s 2018 elections – Five Star – was founded by a former comedian, while the favourite to win this month’s presidential election in Ukraine is also a comedian. The funny side of Boris Johnson has been fading for some time. But it is still clear that the man currently favourite to be Britain’s next Prime Minister has milked his comedy value effectively over the past twenty years, with Have I Got News For You playing a particularly important role in raising the national profile of the blustering blond buffoon. There is nothing funny about the political consequences of men such as Donald Trump and Johnson, but it is hard to deny that they generate plenty of the kind of ‘content’ that entertains their opponents on the liberal-left. Shows such as Have I Got News For You, or The Daily Show in the United States, have no doubt provided a crucial pressure valve for those on the liberal-left seeking to cope with political events that seem beyond reason. But they also risk creating an unspoken partnership between reckless conservative politicians and their critics, with the latter using mockery and laughter to distance themselves from the seriousness of the situation, while raising the profile of such politicians further. Politics and comedy are dissolving into one another in disturbing ways. But perhaps we can go even further: in key respects, the public sphere has been reconfigured over the past twenty years around the template of the stand-up comedy club. The precedent for our turbulent, unruly, hilarious, dangerous political moment lies in those late-night sessions, above pubs and underground, where an individual seeks to tame and tickle a crowd, occasionally getting diverted into dealing with a heckler. The root cause of this fusion of comedy with politics is the digitisation of our public sphere, with all the innovations and expansions that have gone with it. In its idealised liberal form, the ‘public sphere’ granted an unrivalled power to the technology of the printing press and the judgement of the critic. Books, magazines, journals and newspapers were the original conduits of national and international public argument, with respect to knowledge, culture and politics. Print publications allowed scholars to criticise and learn from one another. They allowed artistic pioneers to acquire reputation. Despite the model of the European salon or coffee shop celebrated by Jurgen Habermas and Richard Sennett, it was print technology that allowed arguments to be conducted over time and space. The possibility of a reasoned, thoughtful critique of a novel, political speech, artwork or policy depended originally on the specific affordances of the press. Daily newspapers allowed vast publics to inhabit a shared chronology (facilitating the ‘imagined community’ that Benedict Anderson saw as the central artefact of nations), but one which operated according to a particular metronomic punctuality. Debates could continue via the letters’ pages of newspapers or – more slowly – the pages of scholarly journals for months or years. The recent valorisation of live debate, in the hands of celebrities such as Richard Dawkins and Jordan Peterson, is more a symptom of a given business model, where audiences (and potential book buyers) are attracted to the frisson of staged intellectual combat, than it is a testimony to ‘reason’ or ‘enlightenment’. Critique necessarily involves delay. Even where an artwork involves performance, such as a concert or piece of theatre, and where its effect is visceral and dramatic, a critic still requires some time to convert their experience into thoughts, reflections and judgement. It’s perfectly possible for a critic to be greatly affected by something in the moment – for instance a political speech or film – while concluding, on reflection, that it was bad. Politicians who deploy emotional techniques too readily are accused of demagoguery, while art that panders to nostalgia or romantic cliché is accused of being schmaltzy or sentimental. In this analogue context, stand-up comedy was always a bit of an anomaly. What, after all, is the point of critique when it comes to live comedy? If an audience is doubled up in laughter, in what sense could the critic declare the comedy unworthy? If a comedian is dying on their feet, how could they possibly be judged to be any good? Unlike virtually any other cultural form, stand-up comedy is real-time, or it is nothing at all. Stand-up comedy comes with its own inbuilt form of critical feedback, namely laughter. Except laughter is not really critical feedback at all. For one thing, it operates via the body as much as the mind, gripping our chests, evading conscious control. For another, it emanates from the crowd as much as from the individual, with all of the unpredictable patterns that go with crowd behaviour. But what most distinguishes laughter from a judgement is that judgements can be ‘positive’ or ‘negative’, pinpointing merits and weaknesses. A book review can lavish praise or deliver a hatchet-job. A comedy audience, on the other hand, can either laugh… or not. The quality of a stand-up comedian is reflected in how much positive feedback they get. A bad comedian doesn’t receive bad feedback; they receive no feedback. There is, of course, an exception to this which arises when hecklers intervene. And yet the heckle is not a criticism, so much as an attention-grabbing disruption. It throws down a challenge to the comedian to react and seize control of the situation. If they succeed in doing so, they can appear brave and smart in their ability to think quickly. The unrehearsed nature of the heckle and put-down grants them an air of authenticity and excitement, that the scripted performance cannot attain on its own. The triumphant comedian takes on heroic qualities in the eyes of their audience, being not just brave enough to do stand-up at all, but seemingly possessed of a real-time wit that is displayed like a master swordsman. There is a suspension of disbelief at work, where the audience convinces themselves that the hero is really like this, that they are not witnessing the carefully-honed fruits of thousands of gigs (it is a motto within Britain’s stand-up community that you don’t really know what you’re doing on stage until you’ve done 500 gigs), but a genuinely brilliant person seizing control of a crowd. The persona and the person are one and the same. This template for public performance, reaction and disruption is now being recreated in various situations, not least in and around the institutions of democracy. This might go some way to explaining why professional and quasi-comedians now seem to possess some kind of advantage in the new political landscape. First of all, the explosion of media bandwidth over the past twenty years, which has normalised the twenty-four-hour news cycle, has meant that the public sphere is less dominated by critics, than by real-time reaction. Evidently, some people have more influence over the reaction than others: just as there are professional ‘influencers’, there are now professional ‘reactors’ such as Piers Morgan and Toby Young, whose main role in public life is to divert attention in certain directions, and encourage audience response. Twitter provides a constant, rolling, twenty-four seven version of the comedy club audience, laughing back at the figures on the stage, periodically hurling chunks of abuse from the anonymity of the unlit auditorium. None of this is criticism as such, and most of it would be meaningless if it was delayed, even by just a few hours. Like laughter, it is real-time feedback, that all counts as attention of one kind or another. Technologies are developing all the time to facilitate greater ease of feedback, along with the capacity to quantify and analyse it. The Facebook ‘reaction’ buttons (like, angry, wow, laughter, sad) are one example, while twitter ‘likes’ and ‘retweets’ are another. Facial analytics and other behavioural monitoring tools expand the capacity to harvest real-time sentiment from audiences. As far as the digital platforms are concerned, the objective here is really no different from a comedy club manager: to ensure that as many people are bringing their reactions to this location, and not to a rival one. What a ‘like’ or ‘favourite’ means, or why it was given, is beside the point. Like the laughter that ripples through a comedy club, it was how things felt at the time. Like the audience in the club, the online crowd is amenable to waves of feeling, that grip its members in ways that they don’t expect and can’t always easily explain. As Seymour argues, this can only really be understood as a ‘somatic’ phenomenon, that is, a process that passes from one physical body to another, only now mediated by touchscreens, wireless networks and algorithms, creating long-distance, real-time crowds. Unlike publishers, the platforms are not looking for positive judgement of the content they host, but intensity of sentiment, regardless of whether it is ‘positive’ or ‘negative’ (Facebook, presumably, sees ‘angry’ or ‘sad’ reaction as of equal value to ‘like’). With YouTube, Facebook and Twitter coming under increasing fire for their hosting of hateful and violent content, it needs to be remembered that – as for the comedy club – the only bad content, from the perspective of their business model, is that which provokes no engagement or feedback at all. One of the challenges presented to politicians by the twenty-four-hour, real-time public sphere is that they can be ‘heckled’ at any time. They’re never entirely off-stage. The phenomenon of MPs being harassed in the street is an ugly and troubling political development, but it is partly an effect of ubiquitous smartphones and YouTube. Invariably, the harasser (or their accomplice) is filming the event, in the hope of gaining some online respect. Court hearings now face similar threats from political movements, such as Stephen Yaxley-Lennon’s (‘Tommy Robinson’), aimed at politicising them. The same is true of most disruptions of campus events. Politicians who can navigate real-time disturbances, on camera, while maintaining their composure can reap huge political dividends. Never has Jeremy Corbyn outshone Theresa May as much as he did in the summer of 2017, following footage of the two leaders visiting Grenfell Tower survivors. Corbyn appeared relaxed and physically intimate with people, while May looked uncomfortable and formal. Like the stand-up going off script, the heroism of leaders in this climate is demonstrated when protocol is abandoned, and everything comes down to live performance. It is a sign of how badly May is suited to the present media climate, that she allegedly speaks from a script even during private meetings. 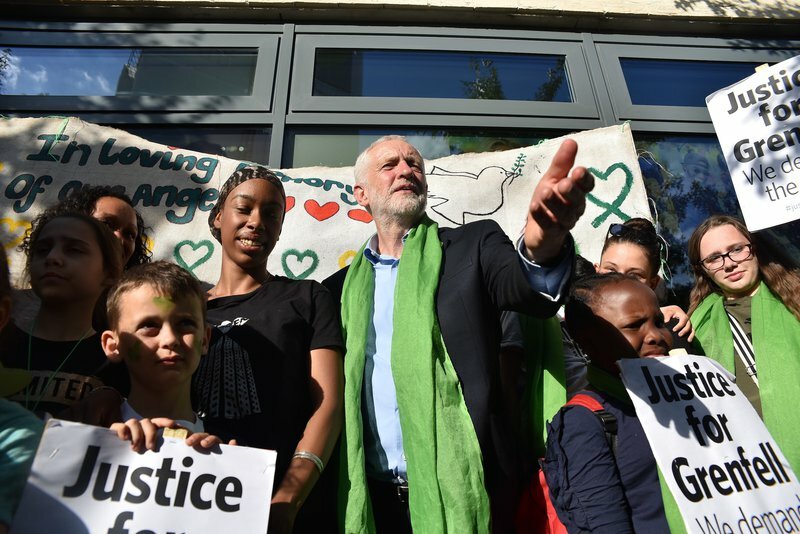 Jeremy Corbyn joined people the silent march to for the first anniversary of the Grenfell Tower fire on June 14, 2018. | NurPhoto/PA. All rights reserved. Trump’s 2016 rallies took the cult of live performance to ridiculous lengths. Frequently compared to the atmosphere at WWE wrestling bouts, these events were a manic combination of the scripted, the unscripted and the scripted ‘unscripted’, complete with hecklers being dragged out by security, and Trump taking every opportunity to be as Trump as possible. As with live comedy, so for wrestling and Trump rallies, the critic is blindsided by an event where everything is in the delivery, and the lasting contribution is neither here nor there. It’s not news that ‘authenticity’ is a highly prized attribute in this era of anti-politics. But as with the authenticity of the stand-up comedian, this is a complicated asset that usually takes considerable practice. Just as the greatest achievement of a stand-up is to convince the audience that the whole thing is spontaneous – that they’re really getting to hang out with a brilliant wit – a figure such as Boris Johnson has had plenty of opportunity to tinker with the character known as ‘Boris’. As any stand-up will tell you, the trick is to find the part or version of yourself that you’re most confident and comfortable sharing, which can take time to identify. It’s neither ‘fake’ nor ‘real’, but something else altogether. The danger this whole situation poses is that we constantly encounter serious issues packaged up with unserious ones. The mood of Brexit is one of gloomy hilarity, generating a media cycle of absurdity, outrage, ridicule and fear, but which never quite seems to descend on anything real or permanent. One reason for this affective state is that, where Brexit is concerned, there really isn’t much time, making critical distance and delay harder to come by. It is a situation ripe for demagoguery, where a skilled and ‘authentic’ personality can face down opponents live, on camera. A further risk is that harmful policies only become publicly denounced, once they’ve become outrageous, and even then the denunciators are often vying for attention. It was reported this week that 54% of British voters believe that the UK now needs a “strong leader willing to break the rules”. What might such a figure look like? Images of ‘strong men’ rulers are usually of military types, with scant regard for rule of law. But it’s just as likely (perhaps more so) that such a figure could arise in Britain in the guise of a heroic wit, who successfully puts dissenting ‘hecklers’ in their place with great panache. Those who’ve honed such personae over years will be well placed to seize this political moment. Avoiding this will require the rest of us, where possible, to resist getting seduced by humour, rhetorical reflexes and bravado. We need to find an alternative to the kind of ‘heckling’ reaction that dominates the twenty-four-seven news cycle, especially on social media, which the performer ultimately benefits from. In place of staged combat, we need to find the time and the space to carry out critical analysis. A bit of humourlessness might go a long way.